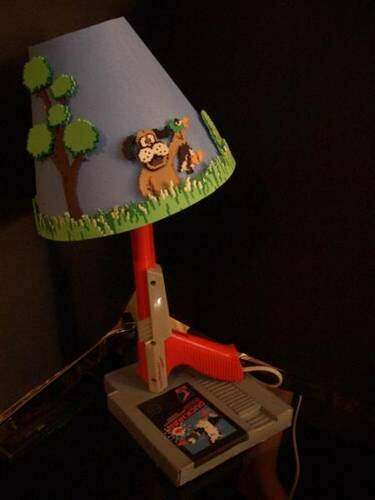 CrunchGear points to this pretty amazing Duck Hunt NES zapper lamp that features not only a Duck Hunt lampshade and orange plastic zapper, but also a replica Duck Hunt cart made of cardboard. Lamp creator fluffypants says that the typical cartridge wasn't large enough to be stable, so she created a 1.5 scale replica to serve as the base. Pretty neat, though I wish she had slapped on a mocking dog on the other side of the shade.